Read by QXMD: Keep Up with the Literature Painlessly! Computerized Textbook of Medicine Exhibit Coming Soon! Improve Your Library Research Skills! We now subscribe to F1000Workspace, a bibliographic management and literature discovery tool that allows you to create and organize a library of citations, connect to new literature, and collaborate more efficiently. Unlike many other citation management tools, F1000Workspace works well in the cloud and allows for group citing and editing of manuscripts via Google Docs (similar to Zotero). 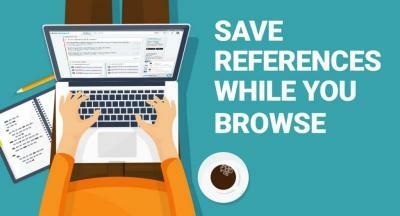 Click "Create free account now"
Contact the Medical Library & Archives for more help! Looking for a way to keep up with your favorite journals? Want easier access to the full text articles on your mobile phone? We now offer easy, seamless, one tap access to full-text articles via our institutional edition of the Read by QxMD app! Download Read by QxMD or search in the appropriate app store. A Web version is also available. Add Duke as your institution in the Account Settings under Institutional Access. You may be prompted to enter your Duke NetID and password. 3. If you already have Read by QxMD, add Duke to your Account Settings to get continuous access to Duke's subscription. The Read by QxMD app simplifies your access to Duke's subscription articles and journals. Based on your specialty interests, Read by QxMD will provide a curated content feed. You can create collections of articles and easily share them with others, as well as annotate, organize, and share citations via social media and email. Please note: Read by QxMD does allow external groups to promote specific articles. This means an organization or company could promote articles to you. However, they cannot promote material that isn’t a peer reviewed article. So, use your critical appraisal skills when looking at promoted articles, which we’re sure you are doing anyway! 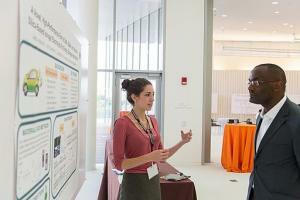 Do you have a conference, meeting, or class assignment coming up that involves creating a poster? If so, we can help! Check out our Poster Guide which offers best practices on poster creation, poster templates, printing options, and tutorials.. Schedule a consultation to get customized help on your project or drop us a line at medical-librarian@duke.edu! We are on social media! Follow us @dukemedlibrary on both Instagram and Facebook. Read about new medical discoveries or odd scientific tidbits on our Facebook page which features links to interesting and useful articles from more than two dozen sources across the Web. It is a great resource for learning more about what is reported in the broader media landscape concerning science and medicine. After reading about what is happening in the larger scientific community, check out our Instagram page to learn more about Duke Health. Our posts highlight archival materials from our collections including historical photographs, illustrations, publications, and artifacts. We also provide behind-the-scenes looks at archives and library work, information about upcoming events, and much more! As of March 1, an author search for "John Smith" yields 818 results in Scopus. The first 30 authors in this search have over 7,300 articles combined. Scopus assigns author IDs for each author whose work is included in the database: however, in many cases authors are assigned too many IDs in error or may be given credit for someone else’s work. These types of issues may be common in other databases as well. Thankfully, ORCID (pronounced ORKID or ORK ID) is a great solution for differentiating authors and connecting them to all of their own research. ORCID (Open Researcher and Contributor ID), a globally supported non-profit organization, maintains a registry of unique and persistent identifiers for authors that may be used across databases and other places where research is found. All you need to do is register and it only takes 30 seconds! You can then link your ID to other identifiers such as those found in Scopus and LinkedIn. 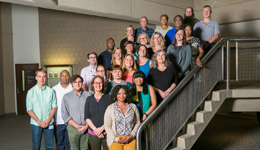 It is highly suggested that you make the most of your new ORCID iD by also including it in the the Duke Directory, Scholars@Duke, grant applications, submissions for publications, Web pages, and more. Keep in mind that some publishers are requiring authors to have ORCID iDs in order to publish their work. Also, some funders such as the National Institutes of Health are requesting that grantees use ORCID iDs to manage information in their systems. It is important to note that if you have multiple Scopus IDs, it is highly suggested that you merge them by running an author search and selecting your author profiles. You may then “Request to merge authors” and follow the steps in the author feedback wizard. It may take up to two weeks for Scopus to confirm that two or more IDs belong to the same author. Select your profile(s) and then confirm your publications list. Your Scopus ID(s) and publications list will then be sent to ORCID upon your authorization. In Scopus, search for an author or title of a publication. Click on an author’s name to see the “Author details” page. From the CrossRef Metadata Search results page, select “Add to ORCID” for articles you have authored. You may need to search for titles or for variations of your name. When you are done, click on your name in the upper right hand corner and then “ORCID record” from the drop-down menu. Note: You may see the public view of your record by selecting “View public version” underneath your name in the left menu pane. You may also copy the public URL to add to Web pages. Authorize ORCID to share your ID with Duke. There are quite a few ways to add your ORCID ID to your LinkedIn profile. From "Add Profile Section" (located underneath your profile photo), you may choose to include the URL to your ORCID public profile in your Intro or add it to the "Publications” section found under “Accomplishments." In the publication title field, you may write “See my publications at: [Enter your ORCID public profile URL here]." There are 6,055,250 ORCID iDs and counting. If you have already registered, but forgotten your iD, search for your name on the ORCID homepage. If not, register today to make finding your research easier for yourself, your supervisors, your colleagues, and others who may find interest in your work. Need assistance? Ask a Librarian or email us! Even frequent visitors to our Library may not be familiar with the long history of two-sided desk that currently sits near the stairs on the First Level of the Seeley G. Mudd building. During the earliest days of Duke Hospital, it sat in the hospital foyer while patients gathered around it before being directed to treatment. In 1967, the entrance to Duke Hospital was changed and the desk was moved to storage. 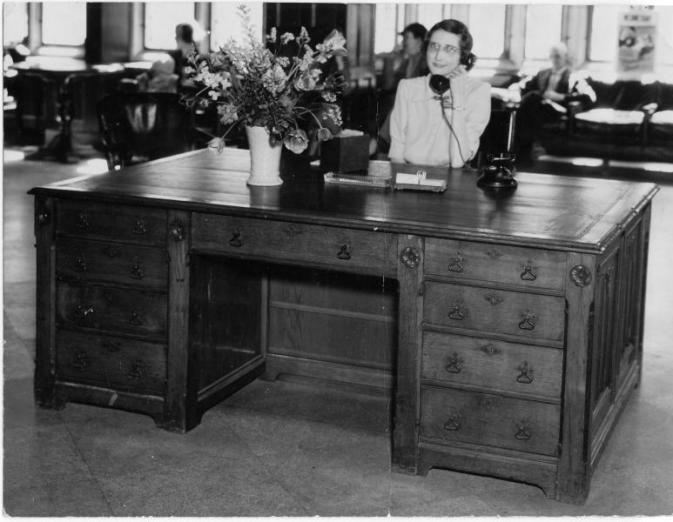 This desk was presented to Duke Hospital by Dr. William John Dann in March, 1938. It was formerly the property of the Reverend Henry Montagu Butler, D.D., headmaster of Harrow School (1859-1885), dean of Gloucester (1885-1886); master of Trinity College, Cambridge (1886-1918); and vice chancellor of Cambridge University (1889-1890). He used this desk at Harrow and later in his study in the Master's Lodge, Trinity College. 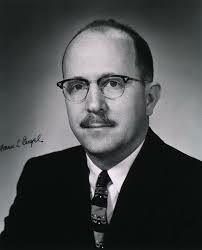 Frank Libman Engel, M.D., 1913-1963, was at Duke University from 1947 until his early death at age 49 in 1963. He was Chief of the Division of Endocrinology in the Department of Medicine and Professor of Medicine and Associate Professor of Physiology. Dr. Engel, known internationally for his research in the fields of endocrinology and metabolic diseases, was a man of many talents and diverse interests. His peers have described him as a gifted teacher, excellent physician, leading experimental endocrinologist, and an administrator endowed with a creative imagination, a scholarly perspective, and the capacity for sustained inquiry. To honor the memory of this man who loved medicine, but enjoyed many other things, his colleagues created a special reading collection to broaden the interests and horizons of health professionals and students. The Engel Collection offers a broad range of cultural and informative reading, including books of general of scientific interest not usually found in a medical library. It remains one of the most popular collections in the Medical Center Library & Archives. A special book plate, based on a caricature of Dr. Engel by Elec Emile Leclercq, identifies each volume. The Engel Collection has been sustained over the years through gifts from his wife, Mildred Engel Handleman, and now his daughter, Susan Engel Zarutskie, M.D. Dr. Zarutskie has also provided a large bequest to support this highly used and cherished collection well into the future. Several new titles have been added to the Library’s special collection established in memory of Dr. Frank Engel, who always thought students should have other reading sources that took them beyond their medical studies. Most reviews are excerpted from Amazon.com. Blood carries life, yet the sight of it makes some people faint. It is a waste product, a commodity pricier than oil, can save lives, and transmit deadly infections. Each of us has roughly nine pints of it, yet many don’t even know their own blood type. And for all its ubiquitousness, the few tablespoons that are discharged by 800 million women are still regarded as taboo. In this book, Rose looks to the future, as researchers seek to bring synthetic blood to a hospital near you. Ticker is part investigative journalism, part medical mystery. It is a dazzling story of modern innovation, recounting fifty years of false starts, abysmal failures and miraculous triumphs, as experienced by one the world’s foremost heart surgeons, O.H. “Bud” Frazier, who has given his life to saving the un-savable. There is no more universal truth in life than death. Though death is certain, the mechanics and understanding of that experience will differ greatly in today’s modern age. Dr. Haider Warraich is a young and brilliant new voice in the conversation about death and dying. In Modern Death, he takes a broader look at death in today's age, from the cellular level up to the very definition of death itself. Celebrated "New York Times" columnist and science writer Carl Zimmer presents a profoundly original perspective on what we pass along from generation to generation. Charles Darwin played a crucial part in turning heredity into a scientific question, and yet he failed spectacularly to answer it. The birth of genetics in the early 1900s seemed to do precisely that. As the technology for studying genes became cheaper, millions of people ordered genetic tests to link themselves to missing parents, distant ancestors, and ethnic identities. Suggestions for purchases? Complete our online Recommend a Purchase form or contact Barbara Dietsch. For a complete list of titles added to our print book collections within the last 3 months, check out the Library's newest print book additions. T oday it is hard to remember a world without computers, but their value in medicine has not always been apparent. As with any new technology, widespread adoption takes time. The Duke University Medical Center has played a crucial role in the development of data science techniques and innovations in medicine and clinical research since the 1960s. This is most clearly evident in the development of the Duke Databank for Cardiovascular Disease, but early data science efforts also played a critical role in other departments. 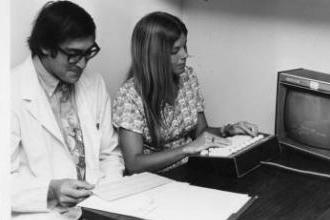 Our upcoming exhibit will explore the history of computation and data science efforts at Duke in context with technological advancements of the twentieth century and similar efforts at other institutions. Leila Ledbetter, Research & Education Librarian and Liaison to the Doctor of Physical Therapy Program, has co-authored the following article: Bullock GS, Faherty MS, Ledbetter L, Thigpen CA, Sell TC, "Shoulder Range of Motion and Baseball Arm Injuries: A Systematic Review and Meta-Analysis," Journal of Athletic Training, 53(12):1190-1199, 2019. Leila Ledbetter, Research & Education Librarian and Liaison to the Doctor of Physical Therapy Program, has co-authored the following article: Green JL, Suresh V, Bittar P, Ledbetter L, Mithani SK, Allori A. "The Utilization of Video Technology in Surgical Education: A Systematic Review," Journal of Surgical Research, 235:171-180, 2019. Amanda Woodward, Research & Education Librarian and Liaison to the School of Nursing, has co-authored the following article: Broome ME, Oermann MH, Douglas CE, Simmons DF, Woodward A, "Publication Productivity of Nursing Faculty in Selected Schools of Nursing Across the United States," Journal of Nursing Scholarship, February 14, 2019. The Medical Center Library offers training on a variety of topics. Request a session for yourself or a group, schedule an appointment for a research consultation, or register for a class. Subscribe to our newsletter and be notified when a new issue is published!